So, it beginneth! My long contemplated Victorian era supernatural horror campaign. We had a group character creation session last night (I like those! ), and now have an assortment of gentlemen and ladies with an interest in the occult and strange. No classes or levels. PCs are all basically 1st level fighters (in terms of hit points and saving throws). Experience progression in the standard sense is not going to be an aspect of the campaign. Characters gain a number of areas of specialist education / academic knowledge based on their INT score. Characters have a number of useful contacts based on their CHA score. Every character also has four talents: things they're good at. These could be in the domains of sports, arts, crafts, culture, etc. An alternate damage system (to account for the lack of healing magic), where PCs have a pool of CON / 2 "wound points". Hit points then represent mostly fatigue, and can be recovered quickly, while wound points represent real damage and regenerate slowly. We have the first game next week, so I'll report how it goes. I've never run a horror game, or a modern(ish) era game, so it'll be an interesting experiment! D&D Previous & the "Core Mechanic"
Yeah, so as you may guess from the title of this post, I wasn't at all impressed by the D&D Next playtest rules. As I've seen some other people opining, it seems to be a kind of D&D 3 "lite". Which is fair enough if you like that kind of thing -- and actually I think they've done a good job so far of D&D 3 "lite", if that's their intention. I guess there's a big market for that kind of game. Two things in particular grate for me though. Firstly their insistence on giving monsters ability scores. This leads to a plethora of ludicrosities (such as having to decide how charismatic a beetle is), and apparently is only for the benefit of opposed rolls (sicK) and saving throws. The latter could obviously have easily been implemented using a different system (in fact I'd say that for monsters who ever needs more than a single save value, really?). It makes the game bland. Imagine a game of monopoly where all rules subsystems (such as the auctions and the various types of cards) were replaced by a simple 2d6 roll... Charmless. It leads to players having a knee-jerk instinct to start rolling d20s whenever their character does anything. Before the referee has even told them if it will "just work", is impossible or will require some kind of roll. It makes some things which should be easy too hard, and makes some things which should be hard too easy. I'm no expert on mathematics or probability, but whenever I've played d20-based games (which D&D Next is, from what we've seen so far) I've gotten this annoying feeling of my character not being able to do anything successfully. The to hit roll in combat, which is where the whole d20 roll originates, is designed to be very random. Other things in life just aren't that random. Using one single die type for everything assumes that everything is equally random. I find it extremely unpleasant to play with such a system. I mean, regarding D&D Next, I wasn't expecting anything different to be honest, and I wasn't expecting to like it (though totally open to being surprised). I guess my point is that, though they've made this big deal about having modular rules systems which can be added and removed to taste (like the "feats" and "skills" systems), I find the core of the game (as far as we can see it now) inherently unpleasant. 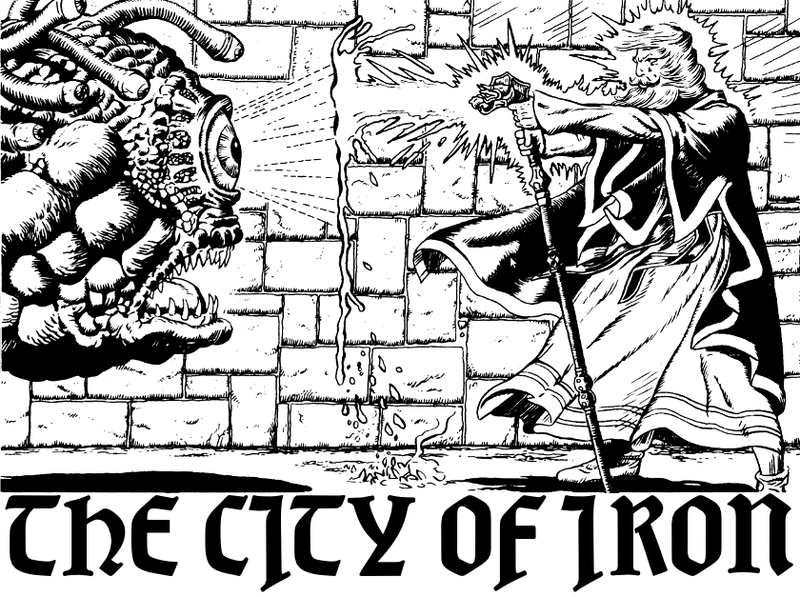 Long live B/X, AD&D, Labyrinth Lord, Swords & Wizardy, LotFP Weird Fantasy, etc etc! I've been talking to the players in my group about possibly starting a new campaign (actually a series of mini-campaigns), and one option that's been discussed is a Victorian era Cthulhuesque campaign. I was considering this some time back, and we even got so far as creating characters, but never got around to playing. One of the main factors in this was that I realised I'm not that keen on the Call of Cthulhu rules, and (moreover) that I just can't be bothered to learn and master some new rules set. It's just not something that interests me. One of the brilliant things about playing Labyrinth Lord for me is that I'm innately familiar with the rules. So I've gotten to thinking about how I might run a Cthuluesque game using a foundation of Labyrinth Lord / basic D&D. Unlike in D&D, in a modern(ish) horror setting the concept of "classes" of adventurer isn't important. What is important however is what characters know and can do -- hence the enormous skills list in CoC. I'm not a fan of skills systems, which was one of the main things which put me off CoC as a rules system, but I'd want some way of defining what each character is good at. Here's what I'm thinking of. 3 to 8: not good at anything, 9 to 12: good at one thing, 13 to 15: good at two things, 16 to 17: good at three things, 18: good at four things. CON: running, can drink anyone under the table, rude health. DEX: shooting, draftsmanship, card shark. WIS: self-control, good judge of character, compassionate soul. CHA: public speaking, "ladies' man", mesmerism. How these areas of skill would actually be used in play would be open to the referee's judgement. One example might be that if characters were given a 1 in 6 chance of achieving a certain task, then characters who are "good at" that thing would get a bonus (probably based on the attribute in question). This morning, after some weeks of procrastination, I finally sat down and went through the last sections of the book making all the modifications suggested by the proofreaders (thanks Alex & Jim!). So, the book's now in Bob's capable hands for some editing. Nothing great to report apart from that, but just wanted to keep people informed on the book's progress, and that it is still bubbling away in the background. Once the editing is complete, the next step will be to finalise the book's layout. Beyond the home-spun documents I've produced in LibreOffice, layout isn't something I have much experience with, so if anyone reading this would be interested in helping out at that stage, any advice or aid would be greatly appreciated! Also if anyone out there would be interested in submitting a few illustrations for the book, please get in touch -- the more the merrier! 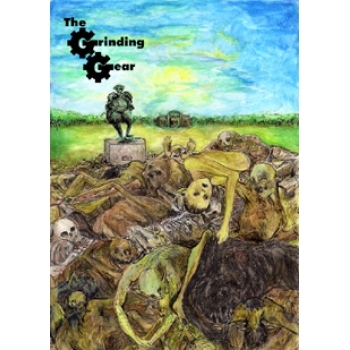 As I recently mentioned, I've been running James Raggi's the Grinding Gear for a small group. I've been running the module as a one-shot, which means that I've not had to insert it into an existing campaign -- giving me free reign on the setting. Obviously, it being a one-shot, the setting isn't that important, and hasn't played a huge role, but the vague background I've imagined is a weird fantasy-esque, early modern setting, with no demi-human PCs, no divine magic, and much more limited arcane magic than one typically finds in D&D. This slightly atypical setting, combined with the fact that it's a one-shot (well, a two-shot now) means that I've been able to play around with a few ideas for new rules. I've already talked about the introduction of mixed-class characters and firearms, so the remaining (and probably most experimental) house rule is my system for fatigue-based spellcasting. I've been mulling over ideas for some time on how one could simply (i.e. without having to rewrite everything!) 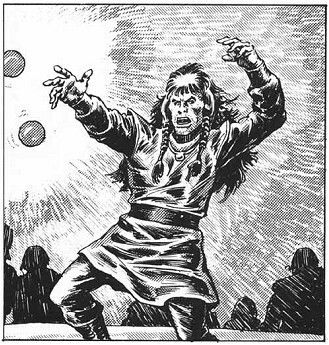 adapt the D&D Vancian spellcasting system to give it more of a low-magic, dangerous edge. From what I've seen of the magic system in Dungeon Crawl Classics, that's kind of the vibe he's going for, but of course that's a very involved rewrite of the magic rules and all the spells, so not what I had in mind. At first I was contemplating some kind of spellcasting roll, with the possibility of nothing -- or varying degrees of bad / weird side-effect -- occurring if the roll fails. 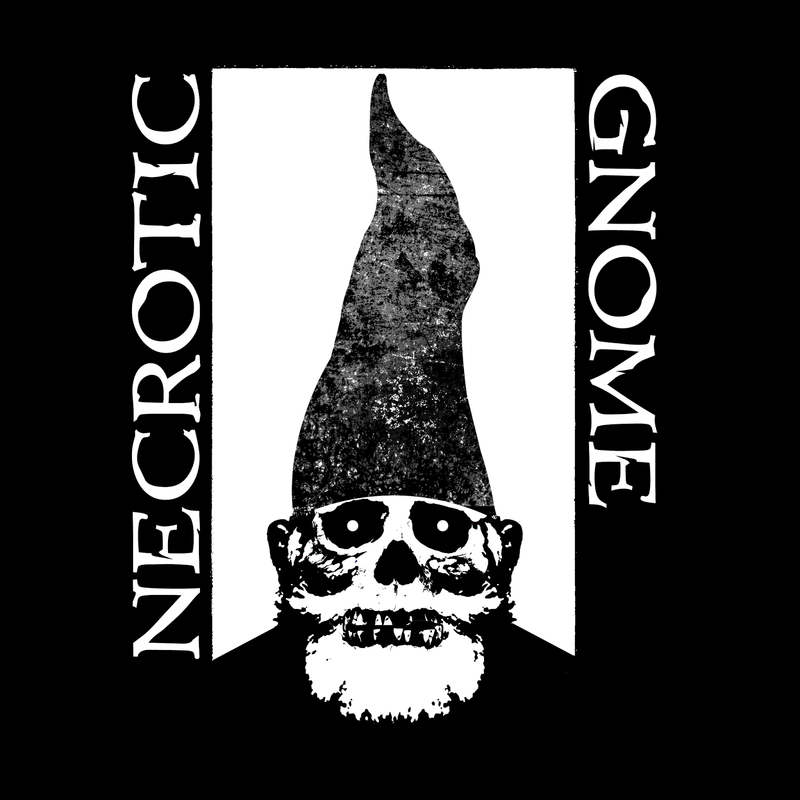 In the end, however, I came up with something far simpler, with a nod to Fighting Fantasy. It works as follows. In the standard system of magic, as presented in traditional D&D, a magic-user's spells must be memorized in advance and vanish from his mind when cast. Thus a spell-caster's puissance is measured by the number of spells which he can fit into his memory at once. Using this alternative system of spellcasting, a magic-user does not need to memorize spells. 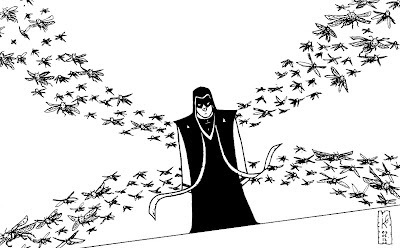 It is assumed that once a magic-user has mastered the formula of a spell, he is able to cast it at will, simply by performing the required gestures and incantations. However, as a counterbalance to this freedom, each spell which is cast drains the caster's reserves, leading to a creeping fatigue and listlessness. This fatigue is simulated by a hit point cost for each spell cast, depending on its level. Thus, as a magic-user casts more spells, his ability to react in dangerous situations, and to avoid serious damage or death, is reduced. Hit points lost due to spell-casting are recovered in a slightly different way to normal. A magic-user's player should keep track of both his current hit point total, and the sum of points which were lost due to magic use. After a full night's rest, all hit points lost as a side-effect of spells cast are restored. On the other hand, hit points lost due to spell-casting cannot be restored by healing spells or magic items. This system enables low level casters (especially those at 1st level) to cast more spells than in standard D&D, while higher level spells, due to their large drain in hit points, will be less frequently used. The only problem I can imagine with this system, and a point which I'm rather unsure of, is that it makes a magic-user's maximum hit point total extremely important. A 1st level MU with one hit point would be unable to cast spells, for example, and a player who made consistently lucky rolls for hit points as his character advanced would be at a great advantage. I've been using the standard spell progression chart to determine the number of spells a magic-user knows, rather than how many spells he can memorize. I've doubled the numbers on the chart, so a 5th level MU would know four 1st, four 2nd and two 3rd level spells. This nicely simplifies the question of how MUs learn new spells. Likewise, I've allowed high INT to grant extra known spells, using the cleric chart for high WIS. Using this system, a few spells might need re-levelling. For example, given that a 1st level magic-user could be able to cast three spells a day, sleep is probably too powerful for a 1st level spell. I'd move it to 2nd level. Yves has risen to the occasion! I can sort of feel a sporadic campaign of Carcosan killy-looty-humpy-party fun coming on! A sure recipe for fun! I ran the adventure as a dinosaur hunt, rather than a "rescue the girl" scenario, but the effect was more or less the same. The cultists were brutally slaughtered (while, of course, doing their own fair share of slaughter back), the ankylosaurus escaped after an epic wrestling battle with an 18' tall PC (gigantism), and the PCs ended up gaining entry to the alien facility, which I decided on the spur of the moment was a disco. I'll try to encourage one of the players to do a write up of the session, if they dare -- it did feature rather a lot of X-rated silliness ;). I love the way Carcosa can be taken dead seriously as a horror setting, but can also be used as a completely gonzo mash-up of dinosaurs, space aliens and mutants! A dino joy ride in the transparent wastes of Carcosa. "What went wrong" by Jeff Rients. A Carcosan mini-adventure by an as yet undisclosed OSR superstar. As I mentioned yesterday, I've been experimenting with a couple of alternative rules in my running of the Grinding Gear. It saw the first outing of my rules for mixed-class characters (which went well, by the way), and my rules for fatigue-based spell casting (which, no doubt, I'll talk about here some time). It also featured (for the first time in any D&D game I've run) some rules for primitive gunpowder weapons, largely influenced by JB's thoughts on the matter. Guns fire high velocity projectiles which can penetrate armour. Pistol shots negate up to 2 points of AC due to armour, musket shots up to 4 points. Loading the weapon (ramming the powder and shot down the muzzle) requires one round. Guns can be carried, but not stored, pre-loaded. A to hit roll of 1 indicates that the weapon has backfired. The user suffers damage as if hit by the gun. The gun is unusable until it is cleaned for 1d6 turns. Matchlock weapons require a smoking slow match (fuse). These matches burn for 1 hour (6 turns) and produce a recognisable odour and light. Slow matches and gunpowder are very susceptible to damage by water & humidity. Fighters may use any type of gun. Thieves and mixed-class characters may use pistols. Pistols have a short range of 20', medium range of 60', and long range of 100'. Muskets have a short range of 40', medium range of 80', and long range of 140'. Powder & shot (10), 5 gp, 1 lb. Only a single pistol shot was fired during the session, but it was impressive -- taking down a flying stirge. I really enjoyed describing the loud noise the gun shot made, how it echoed around the buildings in the inn's courtyard, and the distinctive (atypical for D&D) flavour even this single shot brought to the game. So, the Grinding Gear by the inimitable James Raggi. In the message I sent around looking for interested players, I specifically stated that it was a trap / puzzle heavy module, and a very challenging one at that. I'm glad I did this, as the players came prepared with that knowledge, and took things methodically and cautiously. We started early (10am!) so as to have plenty of time to play through the module, and even then the players only got to the first room of the dungeon after 7 hours! That included about an hour of introduction, general chat and equipment buying, and I guess my DMing style is reasonably slow-paced (I like to savour those feelings of mystery when the players don't have a clue what's happening), but I was still surprised how long the surface area took to explore. I think this is the one thing I'd change about the module -- the extent of the surface areas. I did actually foresee this issue, and removed one floor of the inn, conglomerating the 1st and 2nd floors into one. I think if I were to run it again for a completely new group, I'd consider trying to further reduce the surface area, in order to get into the dungeons proper a bit more quickly. Not that it ever got boring -- there are enough interesting clues and odd items littered around the empty inn to keep interest up -- but I think it would have been nicer to get into the real "meat" of the adventure a bit sooner. As it was, at the point of finding the entrance to the dungeons, the PCs had been seriously wounded by multiple encounters with the stirges on the surface, and decided to retreat to civilisation at this point, ending the session there. The idea being that the PCs would return to the abandoned inn with reinforcements at some later date. I look forward to seeing how they fare with the rest of the module! I think they have a feeling for its deviousness now, which should set them in good stead for what's to come. So how was my experience in terms of this being the first ever purchased module I've run? I enjoyed that as well. There were a few moments where I briefly had the fear that I'd totally forgotten to mention some important fact (which is far less likely with material one has written oneself), but on the whole I found the module was written well enough and concisely enough (a very manageable 16 pages total for the whole adventure) that I didn't have to worry about scanning through pages of descriptive text to find the important bits. A very impressive adventure overall. I definitely hope to run more modules by James Raggi, and would definitely be up for running other pre-written modules, as long as they were written in a similarly concise style. I am about to perform two gaming related activities for the very first time this morning. 1. Run an adventure module which I bought rather than writing myself. 2. Run an adventure written by James Raggi. It's also going to be the first session of D&D (well, Labyrinth Lord) I've ever run where the PCs have firearms. A while back I came up with the idea of a system whereby characters can be created with parts of the abilities of multiple classes -- a kind of simple pick & choose "build your own class" system, intended as a replacement for the (in my experience) over-powered multi-classing rules. Well, after some rumination and tweaks I've just written the idea up properly. You can grab it here as a PDF.